Transcriber's note: This statute addresses the making of ruffs and hose, and the allowable length of swords and daggers "crept alate into the realm," and applies penalties to hosiers, tailors, and cutlers who make or sell the prohibited items. First the Queen's Highness's pleasure is that the laws heretofore made touching the reformation of the excess in apparel, and namely the laws made in 24 Henry VIII  and in 1 & 2 Philip and Mary , be observed, and with all diligence put in execution. And for as much as no sort of people have so much exceeded, or do daily more exceed in the excess of apparel, contrary to the said statutes, than such as be of the meaner sort and be least able with their livings to maintain the same: her Majesty's pleasure and straight commandment is that all justices and officers to whom the reformation thereof may appertain have special regard to the observation and execution, with all severity of the law made 1 & 2 Philip and Mary, purposely for that respect. For the better order in the due execution of which statutes, for her Highness' Chamber it is ordained the Lord Chamberlain and the Vice-Chamberlain, and for her Majesty's Household the Lord Steward, the Treasurer, or the Comptroller, to appoint such trusty officers as they shall think fit to have in those two places special regard to all such as shall after 14 days next following the publication of this ordinance presume to enter into the Court otherwise appareled than is permitted by the said statute, and straight to apprehend and to commit them to ward, there to remain till they shall be duly punished for their offenses, and until such time as they have thoroughly paid and satisfied the penalty of the said statute; examining them first how long and how often they have sithen the time above written after the publication of this ordinance, worn the said apparel, who is their master, and how long they have served him, and how long it hath been that he hath known them to wear any part of the same apparel. Upon which examination, the master straight to be sent for to appear (if the offense be found in the Chamber) before the Lord Chamberlain or Vice-Chamberlain, and before the Lord Steward, Treasurer, or Comptroller if it be found in the Household. And in case it shall appear by any due mean that the said master had knowledge of the said servant's abuse, so long time as in the said statute is prescribed, they to take of him a bond of two hundred marks to the Queen's Highness's use to answer the forfeiture fallen upon him by the said statute; which bond if he shall refuse, then to commit him to ward, there to remain till he shall have satisfied the penalty. The said examination and obligation to be sent to one of the Queen's Highness's remembrances in the Exchequer, to be by them called upon according to the effect of the said statute; the parties appointed to this execution to have for their pains the money of the forfeiture appointed by the law. Provided that in case it shall be thought fit to be dispensed withal within the Court for any person upon reasonable cause, the Lord Chamberlain or the Lord Steward, knowing first her Highness's pleasure, shall and may license them by writing subscribed with one of their hands, testifying her Majesty's said pleasure; foreseeing that none of them do thereby use any apparel inhibited unto them but during such time as they shall attend upon her Highness's person. And within the city of London and the liberties of the same, the mayor and Court of aldermen shall take and observe the like order; that is to say, to appoint in every ward four substantial and well meaning men to see the said statute executed in such sort as is ordained in the Court. And the said four, or any of them, to examine all offenders in the sort above written; and apprehending them, to bring them to the alderman of the ward, he to commit them to prison, and to certify the examination and confession, and such knowledge of judgement of the truth of the matter as he can attain unto, as well touching the master as the man, to the mayor and Court of aldermen. And they to certify the same undelayedly into the Exchequer, to the intent the forfeitures may be answered; the said four following the execution of the statute to have the moiety of the forfeiture. The like order to be taken and followed within the four Inns of Court, and in all the houses of Chancery, by the principals and ancients of the house, where are noted to be so great disorders at this present as behooveth to be looked upon. The same order to be followed in like sort in the suburbs out of the liberties of London, and in Westminster, and in all other exempted places, by the officers of those places. And finally, like order to be observed in all cities, towns, and villages throughout the realm. In all cities and towns corporate, the order to be executed by the mayor, bailiffs, and other head officers. And in all towns and villages, the justices of peace in every several shire to follow the like order for the apprehension, examination, taking of bonds, committing to prison, and certificate into the Exchequer, according as it is abovesaid. The moiety of the penalty to fall to the officer and officers appointed to the execution of the law. The county palatine of Lancaster and Chester to make certificate into the exchequer there, and the exchequer there to the Chancellor of the duchy, and he to certify the same into the exchequer here, to the intent abovesaid. The doings herein of all officers, as well in the Court as in London, in cities and towns corporate, and of the justices of all other places through the realm to be certified during the first two months after the publication of this ordinance to be made to the Lord Chancellor of England or to the Lord Keeper of the Great Seal every 15 days, and after the said two months expired the same to be made every six weeks during the space of one whole year, and so to continue as by the said Lord Chancellor or Lord Keeper shall be prescribed. And finally, that all Justices of Assize in all their circuits do inquire especially hereof. It is not meant, by any of the above written, to take liberty from any man to make information against any offender in the premises, and to enjoy, if the party be convicted, such part of the penalty as by the said law is appointed, foreseeing that no man be twice convicted for one offense. And to the intent such as shall be appointed in the Court to the execution of the premises may work the more certainly, it is ordained they shall have delivered unto them a brief of the said statutes, the like also to be delivered and sent, printed by themselves, to all parts and parties where the particular knowledge thereof may be thought fit for the better execution of the same. And for the reformation of the use of the monstrous and outrageous greatness of hose, crept alate into the realm to the great slander thereof, and the undoing of a number using the same, being driven for the maintenance thereof to seek unlawful ways as by their own confession have brought them to destruction: it is ordained as abovesaid that no tailor, hosier, or other person, whosoever he shall be, after the day of the publication hereof, shall put any more cloth in any one pair of hose for the outside than one yard and a half, or at the most one yard and three-quarters of a yard of kersey or of any kind of cloth, leather, or any other kind of stuff above the quantity; and in the same hose to be put only one kind of lining besides linen cloth next to the leg if any shall be so disposed; the said lining not to lie loose or bolstered, but to lie just unto their legs, as in some ancient time was accustomed; sarcanet, muckender, or any other like thing used to be worn, and to be plucked out for the furniture of the hose, not to be taken in the name of the said lining. Neither any man under the degree of a baron to wear within his hose any velvet, satin, or other stuff above the estimation or sarcanet or taffeta. For the due and better execution and observation whereof, the Mayor of London and the rulers and officers of the suburbs and of Westminster, and other exempted places, shall immediately, after this proclamation made, call before them in every of their several jurisdictions all hosiers or tailors making hose dwelling within the precincts of the same, and shall bind every of them in the sum of £40 or more as cause shall require, to the Queen's Highness's use, to observe this part of this said proclamation touching hose, without any manner fraud or guile; which bonds, as any shall be found to offend contrary to this ordinance, they shall certify into the Exchequer with the name of every such offender. In all other cities or towns corporate the mayor and head officers shall do in all points the like, and in all other places the justices of peace; the officers of the Exchequer to certify the Lords of the Queen's Highness's Privy Council at the beginning of every term what bonds have come or have been sent into that office touching the premises till that day, and what number of them have been executed. If any hosier shall refuse to enter into such bond, to be immediately committed to ward and to be suffered no more to continue his occupation. Finally, no men undispensed with, in such sort as is abovesaid, be so hardy after 14 days following the publication of this ordinance, to presume to show himself in the Court, or in any other place within this realm, in any pair of hose passing the size abovesaid; that is to say, containing in the netherstocks and upperstocks more than one yard and a half, or above one yard and three-quarters at the most, of the broadest kersey, or with any other stuff beyond that proportion, or with more linings than one and that plain and just to the legs as is abovesaid; neither with any shirts having double ruffs either at the collar or sleeves, which ruffs shall not be worn otherwise than single, and the singleness to be used in a due and mean sort, as was orderly and comely used before the coming in of the outrageous double ruffs which now of late are crept in; or being under the degree of a knight, with any gilted spurs, or any damasking, or gilt sword, rapier or dagger; upon pain of forfeiture of the same and of imprisonment and fine at the Queen's Highness's pleasure for every such offense, to be executed within the Court by such as shall be appointed, in sort as is aforesaid, by the Lord Chamberlain, Vice-Chamberlain, the Lord Steward, the Treasurer, and Comptroller. And in London and within the liberties thereof, to be executed by the sergeants and such others as shall be appointed in form aforesaid, by the mayor and aldermen. In the suburbs, Westminster, and other privileged places, by the officers, rulers, and governors of them; in all other places, by the head officers and justices of peace. In the two universities, the chancellor, or in his absence, the vice-chancellor or commissary, to see to the execution of the said statutes and of all other orders; and none other justice or officer there to meddle, but it shall be by them or one of them appointed. In which places is thought to meet to have an uniformity of apparel according to every several vocation. The heads of colleges and halls of the said universities to be warned by them to see the scholars under their government to observe thoroughly the said statutes and orders, and to abate their ruffs and other unseemly excesses, and to have in their apparel regard to the observation of their statutes and to the decency of using of themselves therein as heretofore hath been used; wherein if either the master shall be found to forget his duty or the scholar to lack obedience, the Queen's Highness shall be forced to appoint others to see unto the due punishment of both sorts. Ladies and gentlewomen attending upon the Queen or resorting to the Court, and their gentlewomen, to be appareled according to the ancient order of the Court; whereof the orders in times past to be put in ure by the gentlemen ushers at the appointment of the Lord Chamberlain, to the intent there may be a difference of estates known by their apparel after the commendable custom in times past used in the Court. Which order is to be sought, renewed, and out of hand to be put in ure by the said Lord Chamberlain, or otherwise to be devised for a certainty of all degrees. And whereas a usage is crept in, contrary to former orders, of wearing of long swords and rapiers, sharpened in such sort as may appear to the usage of them can not tend to defense, which ought to be the very meaning of weapons in times of peace, but to murder and evident death, when the same shall be occupied: her Majesty's pleasure is that no man shall, after ten days next following this proclamation, wear any sword, rapier, or any weapon in their stead passing the length of one yard and half a quarter of blade at the uttermost, neither any dagger above the length of twelve inches in blade, neither any buckler with a sharp point or with any point above two inches in length, upon pain of forfeiting the sword or dagger passing the said length, and the buckler made otherwise than is prescribed, to whomsoever will seize upon it, and the imprisonment of his body that shall be found to wear any of them, and to make fine at her Majesty's will and pleasure. And if any cutler or other artificer shall, after the day of the publication hereof, sell, or have within his shop or house to be sold, or shall make or cause to be made any rapier, sword, dagger, or buckler contrary to this order, to forfeit the same, his body to be imprisoned, and to make fine at the Queen's Highness's pleasure, and to remain in prison till the said fine be fully satisfied; and being taken with the fault the second time, never to be permitted after to use that occupation; which in the Court is to be executed by the officers aforesaid, in the city and within the liberties, by the mayor and Court of aldermen, and such as by them shall be appointed in that sort, as well sergeants as others beforesaid; in Westminster, the suburbs, and other privileged places, by the officers, of the same; in towns corporate by the mayor and other head officers, and in all other places by the justices of peace. And finally, Her Majesty straightly chargeth as well the said Lord Chamberlain, Vice-Chamberlain, the Lord Steward, the Treasurer, and Comptroller of the household, as the Lord Chamberlain, Vice-Chamberlain, and such as under them shall be appointed and assigned, the Mayor of London, and all other mayors, sheriffs, bailiffs, constables, and justices of peace, all principals and ancients of the Inns of Court and Chancery, the chancellor and vice-chancellor of both universities, and the heads of halls and colleges of the same, and all other her Highness's officers and ministers, each of them in their jurisdictions, to see these orders being set forth and confirmed by her Majesty's proclamation, to be duly and speedily executed in form aforesaid, as they will answer for the contrary at their peril, and will avoid her Highness's displeasure and indignation. Illustration: Double Ruff. 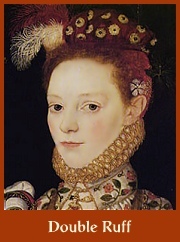 Unknown Girl, 1569. Attributed to the Master of the Countess of Warwick, courtesy the Elizabethan Costume Gallery.